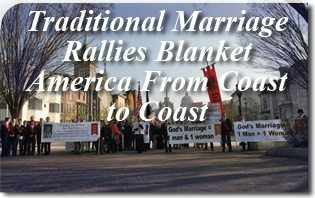 On March 17, traditional marriage rallies were carried out all across America from California to New York. The Saturday noon rallies were organized on a national level by America Needs Fatima, a campaign of the American Society for the Defense of Tradition, Family and Property (TFP). Participants were largely concerned lay Catholics alarmed at the rapid advance of the radical homosexual agenda and even more alarmed at the tragic lack of leadership from politicians and clergy on this crucial issue. 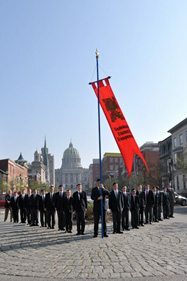 An estimate 100-200 traditional marriage rallies were held in the public square. The battle for marriage is very important since if no one defends this sacred institution, its destruction will quickly become an accomplished fact, opening wide the doors to the other forms of immorality. 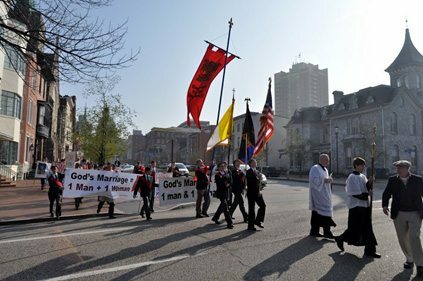 These photos are of the Saint Louis de Montfort Academy at the Traditional Marriage Crusade in Harrisburg, PA, right down from the state capitol building. 4.It validates and promotes the homosexual lifestyle. 5.It turns a moral wrong into a civil right. 6.It does not create a “family,” but a naturally sterile union. 7.It defeats the state’s purpose of benefitting marriage. 8.It imposes its acceptance on all society. 9.It is the cutting edge of the sexual revolution. 10.Most importantly, it offends God. This entry was posted in Events of 2012 by John Ritchie. Bookmark the permalink.